So I’m still trying to decide if I’m just going to start where I am and skip the days I skipped or try to “catch up” with my original plan. Still haven’t decided. Even though I’m a reformed perfectionist, I still REALLY want to post my 31 projects. So I’m probably going to double up. Maybe. We’ll see. The Rummage Sale. HUGE success! We beat our previous record! And it was amazing. And fun and exhausting and LONG and crazy and glorious and EXHAUSTING! I told Husband, I feel like I hiked Mt. Tallac two days in a row. (I’m not a strong hiker, so if this wasn’t challenging hike for you, don’t judge. I remember almost crying on this hike. Or maybe I did cry. I’ve blocked most of it. I just remember it was HARD.) I started Rummage Sale day at 4:30AM, got there around 5:30, got home around 3:00, napped 4:00-5:30, ate dinner, then back in bed by 8:00. Slept 10+ hours and woke up feeling like I had the flu. Spent most of Sunday recovering. 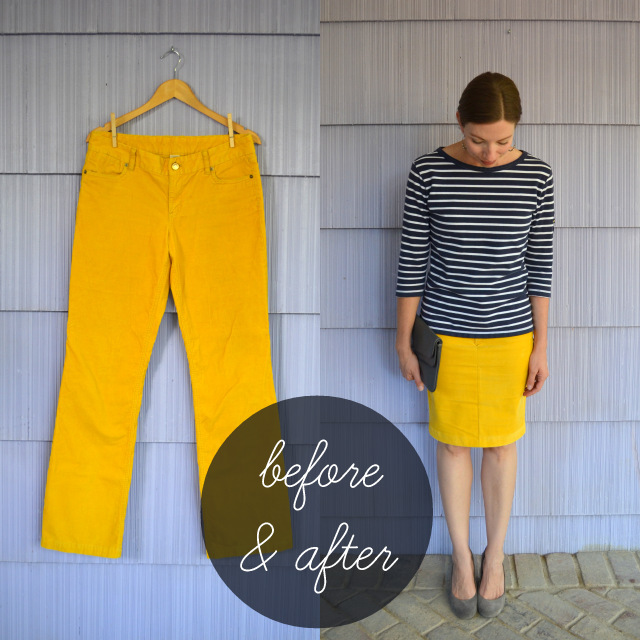 But by afternoon, I was feeling much more like me, so I tackled my yellow project. 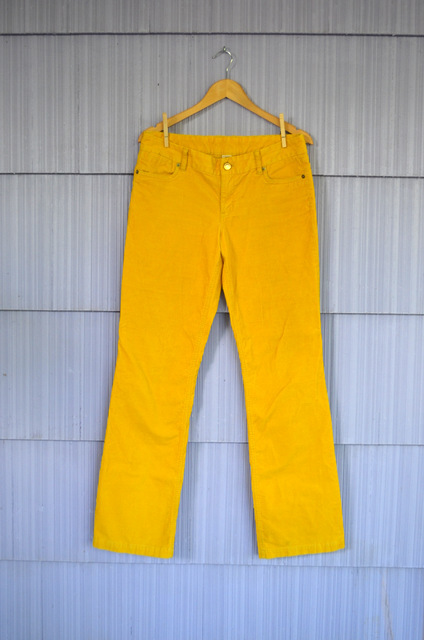 Remember these pants? They are J.Crew cords I thrifted a few weeks ago. I knew the moment I saw them that they wanted to be a skirt. 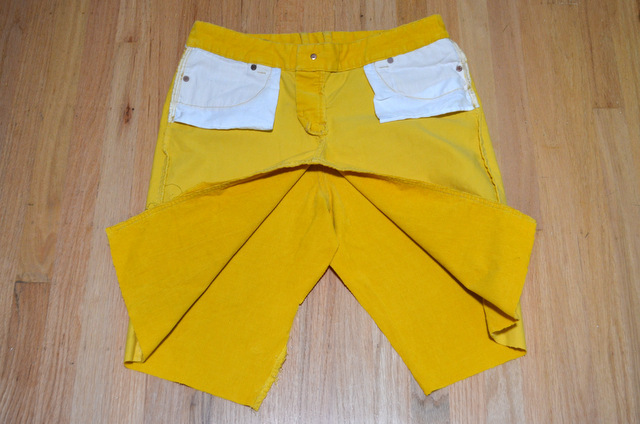 Luckily, they were several sizes too big, which makes them perfect for converting. I started by slowing ripping apart the seams with my trusty seam ripper. Then I got impatient, so I used scissors to cut along the seam. Took about 15 seconds. That’s about my patience level right now. I turned them sideways so the side seams were in the middle and the front and back seams were on the sides. 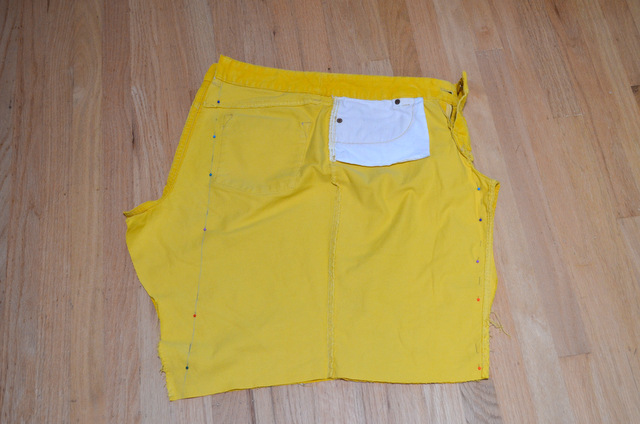 I pinned these to make a straight line (because when you cut apart pants, there are lots of wonky angles). I sewed a straight stitch along these two lines. I used an iron to press open these seams. I got a little nervous when the iron made the corduroy appear to change color, but it was fine. 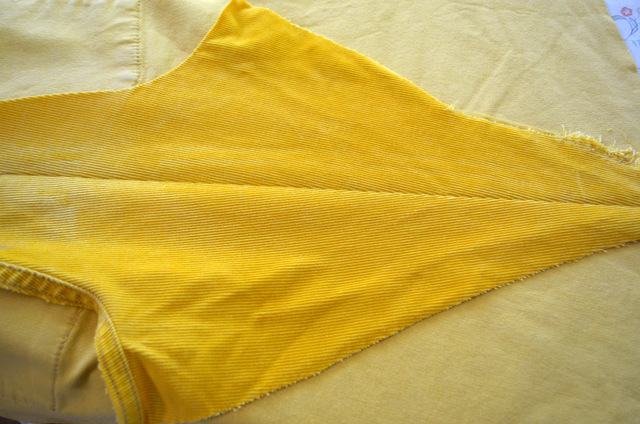 I trimmed the excess fabric and used a zigzag stitch to secure the seam edges. 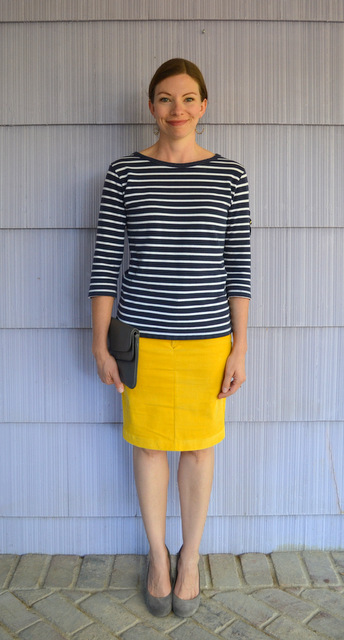 Then I hemmed the bottom of the skirt using my ruler trick. Done! 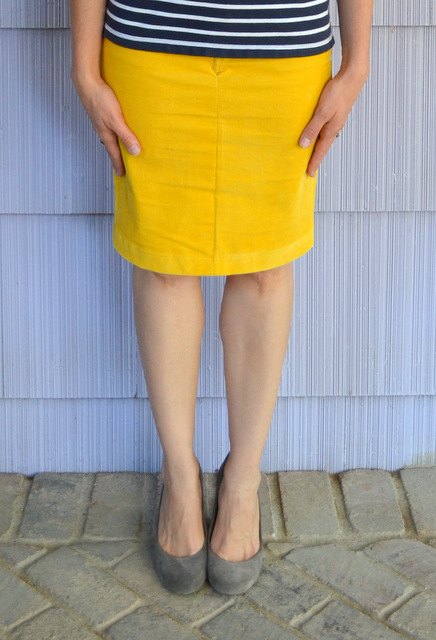 A yellow skirt has been on my “thrift list” for over a year. Instead, I made one. 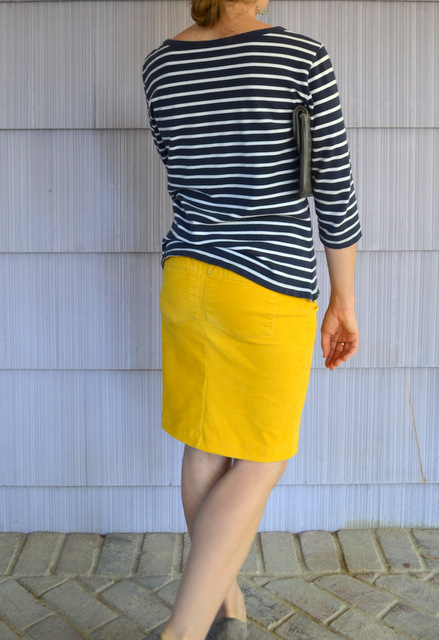 I think a yellow corduroy skirt in October is beautiful. And making it from pants is pretty fun, too. 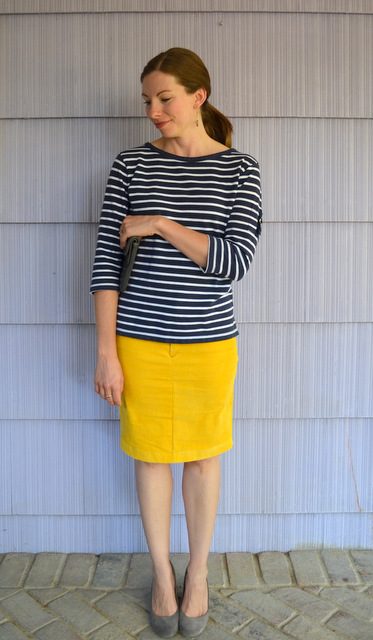 Previous Post 31 Days: Color – Day 3: Yellow – not so mellow! I love the skirt! I also love that color but sadly, it does not look good with my complexion so I just admire it from afar :) Great job with the rummage sale- it was so well executed! Congratulations on a successful event, Nicole! Thank you, Mary! It was such a fun event!